App developers are increasingly adopting Apple Pay as a fast, convenient way to enable purchases, often as an alternative to standing in line at a store's cash register or manually entering in billing and shipping information. Apple Pay is often thought of as an alternative to swiping credit cards in stores (where it recently exceeded 2 million locations). However, Apple Pay acceptance within apps is also rapidly expanding--accelerated in part because it doesn't require any special NFC hardware terminals, just a minor code update by developers. 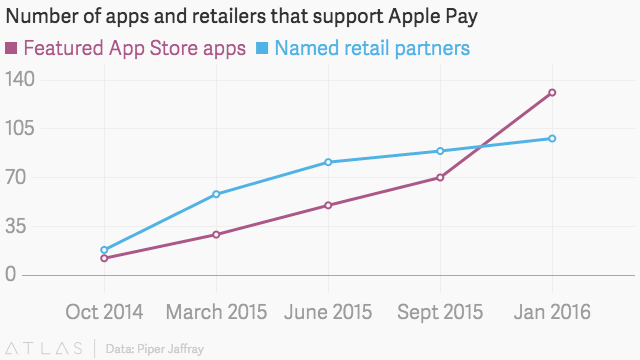 A report by Ian Kar for Quartz highlighted Apple Pay's use in apps as quietly making "serious progress in mobile commerce," citing data from Piper Jaffray analyst Gene Munster who described "an acceleration in the number of apps that accept Apple Pay" as having reached an "inflection point." Online customers are often frustrated enough during online checkouts that they abandon their shopping cart without buying anything. 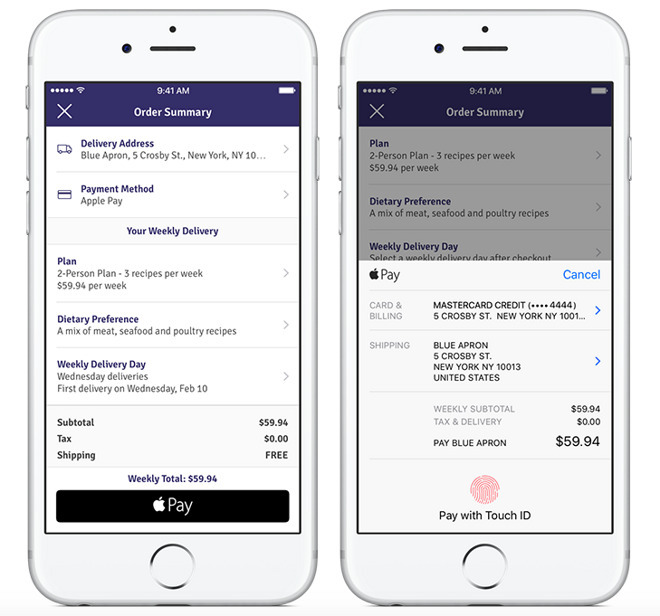 Apps supporting Apple Pay report that the faster, streamlined payment option results in a significant improvement in order completions. Men's clothing shopping app JackThreads was cited in the article as noting that customers using Apple Pay were 92 percent more likely to complete their transaction. 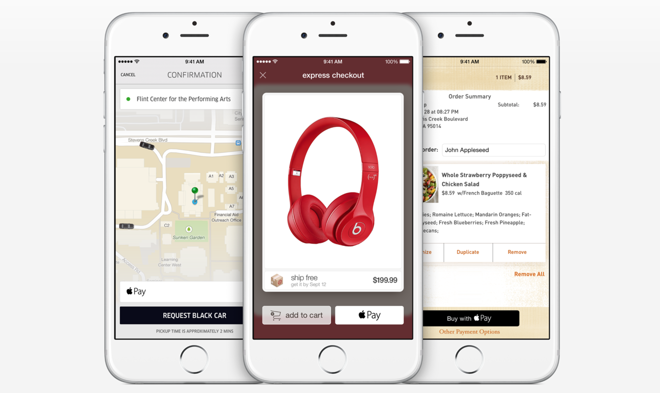 In addition to Apple Pay apps that parallel a web-based online shopping experience (including B&H, Best Buy, Groupon, Staples, Target and Zappos), a variety of new app-based services have also adopted an in-app Apple Pay experience (including AirBnb, Easy, Eventbright, Hotel Tonight, Kickstarter, Lyft and Uber). There's also a new hybrid model for online ordering in physical stores that's using in-app Apple Pay to streamline purchases. Apple's own retail store app, for example, allows buyers to complete a transaction without waiting for a register or an store associate with an EasyPay card swiper. Apps for Starbucks, Panera Bread and Dunkin' Donuts similarly let customers pay in-app with a touch of Apple Pay, and apps such as Downtown and Yelp's Eat24 let buyers order and pay for food at a variety of participating restaurants using Apple Pay without ever needing to stand in line to order. Services like OpenTable similarly let foodies make restaurant reservations and then pay their food bill via Apple Pay in-app. Another class of apps making use of Apple Pay involve food or beverage delivery--either for prepared meals (including Caviar, Door Dash, Savory and Postmarks); beer, wine and liquor delivery (via Buttery) or custom created menus for delivery of raw ingredients and recipes for at-home chefs with limited time, including Blue Apron, a company that just released new support for in-app Apple Pay today. Apple has profiled a wide variety of app titles that have incorporated Apple Pay in a special Buy with Apple Pay App Store page.